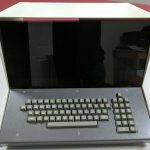 The Kenbak-1 is considered by the Computer History Museum and the American Computer Museum to be the world’s first “personal computer”, invented by John V. Blankenbaker (1930-) of Kenbak Corporation in 1970, and first sold in early 1971. Only 50 machines were ever built. The system first sold for US$750. Today only 14 machines are believed to exist worldwide, in the hands of various collectors. Production of the Kenbak-1 stopped in 1973. The system on display at LSIM is a true, functional replica, down to the chip, of the original design, and operates identically to the original. There is an original Kenbak-1 coding sheet, with authentication letter from John Blankenbaker, also on display in this collection.